When NASA actually makes a comment about a UFO, even if it’s just to deny it and give its own explanation, it’s big news. When NASA makes two comments about UFOs in one week, it’s even bigger news. When NASA admits it doesn’t know what one of these unidentified objects is, it’s time to sit up, pay attention and see what’s going on. In the near-Earth population, about 16% of asteroids that are about 655 feet or larger are a binary (the primary asteroid with a smaller asteroid moon orbiting it) or even triple systems (two moons). Yes, we can confirm that it is something on Ceres that reflects more sunlight, but what that is remains a mystery. We do not know what the white spot is, but it’s certainly intriguing. In fact, it makes you want to send a spacecraft there to find out, and of course that is exactly what we are doing! 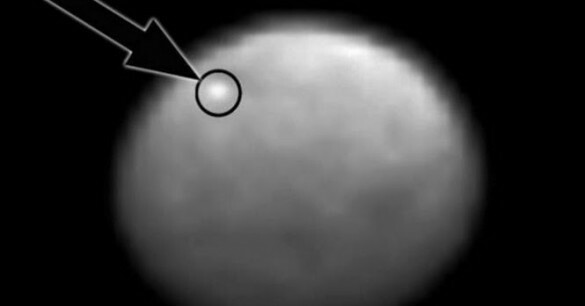 So as Dawn brings Ceres into sharper focus, we will be able to see with exquisite detail what [the white spot] is. Gee, I wonder what NASA will say if it’s a spaceship? In the meantime, two statements in a week from NASA on UFOs means someone is listening. While we have their attention, what do you think the objects are?